Kimi Raikkonen took his second Monaco Grand Prix pole position as Lewis Hamilton had a qualifying session to forget. Meanwhile Hamilton’s Mercedes teammate Valtteri Bottas gave it his all to split the Ferrari’s as McLaren got both cars in to Q3. Millions of Kimi fans have been hoping that the speed and insane levels of commitment and bravery he exhibited in his McLaren days were not gone for good. Today was a wonderful repayment of their faith in the least excitable man in F1. Throughout qualifying it looked like Raikkonen was up for the fight for pole position. 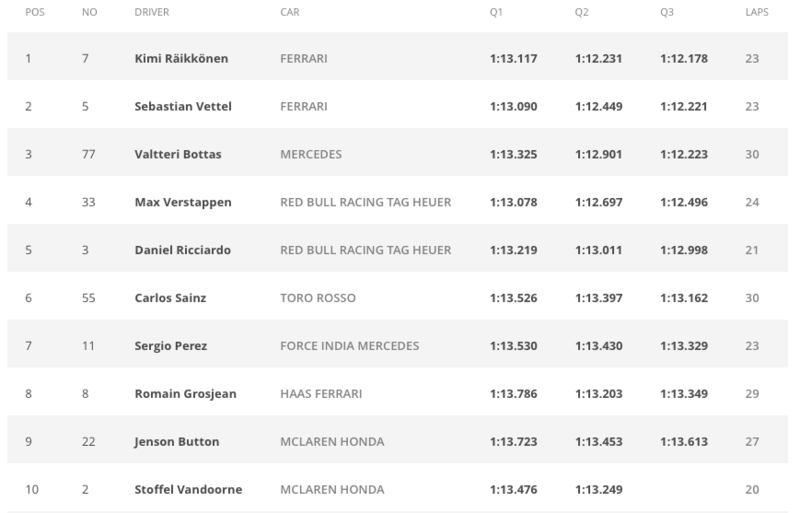 Through Q2 Raikkonen became the man to beat and by Q3 no one could get close. Sadly for Raikkonen his teammate and championship leader Vettel will join him on the front row. The cynic in me believes there might be some ‘adjustments’ happening during the race which would be a real kick in the teeth for the legion of Iceman fans. Hamilton spent most of qualifying performing miraculous saves as his Mercedes tried its best to hit the Monaco armco barriers. The end result was a net 12th place grid start whilst his main title rival finished up on the front row. But this highlights one of the single biggest weaknesses in Hamilton armour – over driving. Mercedes have been chasing a good set up all weekend and clearly had not found the sweet spot on Hamilton’s set up. Historically the triple F1 champion struggles when it comes to working a car that is not behaving. Finessing an unwieldy set up at times appears to be beyond Hamilton. Primary because he tends to rely on his astonishing natural talent to make up for any set up deficiencies. Monaco or moan-aco as it will likely turn out to be for Hamilton was a perfect illustration of that issue. What a simultaneously uplifting and utterly depressing Saturday for McLaren. 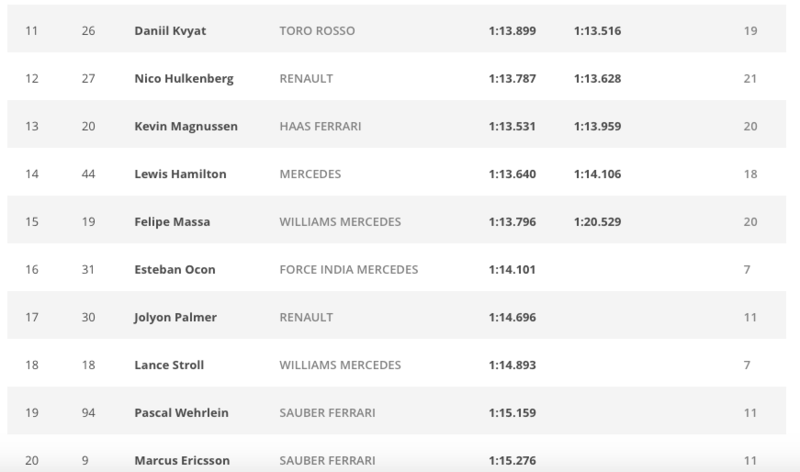 The low of the perhaps inevitable grid penalties made way for the high of having both cars looking set to run in Q3. Until Stoffel Vandoorne stuffed his McLaren in to the barrier at the swimming pool complex. The crash will be a bitter disappointment for the Belgian and the whole team. With (only) a 3-place grid penalty for the former GP2 champion, he had a chance to put himself in contention for much needed points on Sunday afternoon. Of course it is still possible but much harder from 13/14th place on the grid versus a possible 7/8th place. Jolyon Palmer is the kind of guy who could walk in to the Monte-Carlo Casino a multi-millionaire and leave without his shirt. I am no great fan of Palmer – I am not convinced he is anything more than journeyman F1 material. But he is not getting any opportunities to prove me and others right or wrong. It is probably inevitable that Palmer and Renault will part ways at some point this year. It is sad that he will not have had a reasonable chance before then. After a cracking Monaco qualifying session – one the best without the intervention of rain – fingers crossed the race does not disappoint. Click on the qualifying listings below for full results. Previous Post Should IndyCar invest in Alonso?